A moderate shallow earthquake struck the greater Tokyo area in the Japanese night. Although it will probably not be dangerous, a lot of people woke up by the light shaking. If the preliminary location will be confirmed, the epicenter lies in the immediate vicinity of Narita International airport. 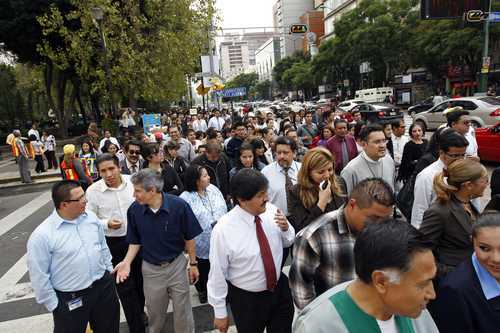 More than 6 million citizens participated in the simulation organized by the Federal District as a preventive measure against a possible earthquake measuring 8.1 degrees on the Richter scale, which would have generated a lot of damage in Mexico City. At 11 am the alarm went off which allowed the evacuation of buildings. The activities were supervised by the head of the Federal District out of the Old City Hall. Strategic objectives of the trial is to protect the lives of citizens. To achieve this goal, effective preparation is necessary to evacuate all buildings or take shelter in safe areas, with emphasis on the school population, hospital facilities and places with a very high concentration of people, like the Metro Public Transport System that moves half a million passengers around that time. Six empowerment groups are specializing in different areas in emergency cases + 1,500 brigades will go to suburbs where their presence will be required. Security personnel and police began evacuating hundreds of passengers from trains, subway platforms etc. Some people were frightened because they did not know that it was a simulation. The security officers indicated where the exits could be found to avoid injuries from pushing, falling etc. After several minutes, people were evacuated without any incident. Despite the setbacks, the passengers expressed their willingness to follow the preventive measures. “I wish there were two or three simulations a year to be prepared for a major earthquake and to prevent accidents such as occurred 25 years ago” said a train passenger. Banks unfortunately refused to participate in the drill. Government buildings were evacuated, in the same way that public and private companies vacated their offices. On streets and avenues people were out of buildings, some in a hurry and others with calm. The average time taken for evacuation in case of an earthquake of that magnitude exceeded 60 seconds. 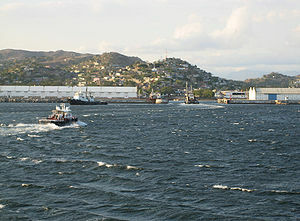 In Benito Juárez it took one minute 49 seconds to evacuate 2,100 people. 150 businesses participated in the exercice. In the Delta Park Mall an explosion was simulated and the square was cleared completely. Emergency and security personnel were also present. A moderate seaquake at the western side of Honshu. Very moderate but shallow earthquake with an epicenter near Petit Goave. Earthquakes with this magnitude normally do not create damage or injuries. However it will be certainly very frightening for the local people. Epicenter in between the Greek island of Crete and Kassos and Karpathos. Exactly the same spot than the devastating earthquake and tsunami from 1303. Very dangerous fault line.